In November 2005, I wrote this essay on how to re-enchant the liturgy for my friend Father Alvin Kimel who was then writing his splendid blog, Pontifications, and in the years since my essay was first published by Father Kimel, I have received many requests for the text. So here it is again. But first an explanatory note. Cradle Catholics born in or after the 1960’s often have great difficulty understanding why the sorry shape of worship in too many of our parishes is now an impediment to countless souls from entering into full communion with the Catholic Church ... particularly Anglicans and Lutherans who are accustomed to splendid music and reverent worship. This difficulty, I believe, comes from not grasping that the “living room liturgy” to which legions of Catholic have now grown attached is not the only way to pray; indeed, it is arguably not an appropriate way to pray at all. But this truth about the nature and purpose of the sacred liturgy has become very difficult for many people to understand; after all, people who live in old shacks still come to think of them as home. But the experience of sloppy worship so common in the past 40 years is an aberration in the long sweep of Christian history, and I believe that we are coming gradually to a recovery of rightly ordered prayer in keeping with our own ancient tradition and contemporary teaching. The principles and practical steps described below, all of which are solidly grounded in the documents of the Second Vatican Council and subsequent liturgical norms, are offered in the service of that recovery. I was baptized in the Episcopal Church, and there I learned to worship the LORD in the beauty of holiness. When I became a Catholic, one of the most difficult adjustments for me was learning to accept the generally wretched state of the sacred liturgy in most parishes: banal language, casual atmosphere, mediocre secular music, ugly buildings badly decorated. In all too many places, the result is simply unspeakable. But this need not be. The Catholic Church gave us Chartres and Canterbury; she gave us plainchant and Palestrina. The Catholic Church saved the language of Cicero, and gave birth to the Christian poetry of the West. The cultural and artistic riches of the Western Church are still in our storehouse; we need only deploy them in a way adapted to the present structure of the Roman Rite. I have been a priest for more than twelve years, and in that time I have served four parishes, one college chaplaincy, and one seminary. In all of those posts, the following characteristics were observed (mutatis mutandis), and the results were splendid. I offer these suggestions for those who seek to “re-enchant” the sacred liturgy for the purpose of leading those who worship more deeply into the Paschal Mystery. 1. The tabernacle must be on the rear wall of the chancel and on the central axis of the church. Putting the LORD anywhere else turns everything else on an angle, and no ideological justification will change the way in which this simple fact destabilizes the liturgy. 2. 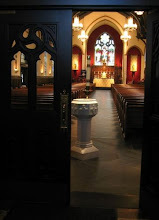 The priest’s chair should face the ambo, not the congregation, and it should ideally be located on the opposite side of the altar from the ambo. When he is seated, the celebrant (like the congregation) should be facing the proclamation of the Word of God; to have him face the people from his chair makes him the focus of attention and invites him to behave like a talk show host. 3. Right angles are preferable to oblique ones. The eye senses rest when it follows one line to a 90 degree angle with another line; it senses motion when any other angle is present. One of the reasons many of our churches do not feel like peaceful houses of prayer to most folk is that the entire building and all of its furnishings are constantly “in motion”. 4. The altar candles should rest on the mensa (the top surface), not on the floor around the altar. The passion for the “naked altar” is bizarre, pagan, and antiquarian for its own sake. Yes, the rubrics do allow for the candles to be on or near the altar, but I believe that placing them on the mensa has an immediate effect towards the re-enchantment of the liturgy. 5. Avoid kitsch in all its forms, including most especially the trendy and sentimental, in decorating the church. Too many churches look like someone’s Italian or Irish grandmother has just finished sprucing up the place. Is it any wonder we have such trouble convincing our men that religion is not women’s work? The sanctuary is the home of the Son of Man; let’s make it look like a place in which most men would be comfortable spending a little time. 1. Stop balkanizing the Mass schedule with different types of music. This trick comes from Protestant church growth strategies, and it teaches our people that divine worship is just a matter of personal taste. Yes, progressive solemnity can distinguish one Mass from another in a large parish (low Mass, sung Mass, solemn Mass, etc. ), but the basic approach to matters musical should remain essentially the same. 2. If the choir is visible to the congregation, move them to a place where they will not be. This is absolutely essential to celebrating liturgy as worship rather than liturgy as entertainment. Yes, Anglicans more or less successfully replaced priests with lay choirs in the chancel, but for several different reasons, that simply does not work in the contemporary Roman Rite. The ideal place, of course, is a loft for organ and choir at the rear of the church. Failing that, at least move them to the back of the church. 3. Sing only sacred music. Much of what is now marketed as “liturgical music” is not sacred at all, and congregations addicted to that pablum are not capable of entering the liturgy as a participation in the worship of the Heavenly Jerusalem. Sacred music is a happy marriage of text and music, and both halves are necessary to re-enchant the liturgy. 4. If you sing hymns, sing the whole hymn. Stopping after the second verse because Father is at his chair makes as little sense as reciting half the Creed. And no “closing hymn” is needed. “The Mass is ended, go in peace” means what it says. Where possible, the priest and ministers should depart the sanctuary to an organ postlude or something comparable. 5. The Anglican, Methodist, and Lutheran traditions have given us an extraordinary treasury of hymnody, most of which can be used in the Catholic liturgy with little or no adaption. This music has proven itself to be durable, effective, and sacred. Do not be afraid of using hymns from this patrimony because they are “Protestant”. In truth, these texts are far more orthodox and “Catholic” than most of the tripe published by Catholics in the past two generations. 6. Plainchant was, is, and ever shall be the music best suited to the Roman Rite. Teach your musicians and your people some simple chants, and sing them well. Even those who struggle with Latin grammar will not need to be taught that this is sacred music. 1. Silence is indispensable. No talking before Mass. Teach the people to be comfortable with prolonged sacred silences during the liturgy by explaining that we’re not just waiting for the next thing to happen; we’re waiting together for the LORD. 2. Teach the people all the gestures proper to them, e.g. profound bow in the Creed, striking the breast at the Confiteor, kneeling at all appropriate times, etc. If the liturgy is just talking, talking, talking, then half the human person is left out of worship. 3. Emphasize coming early and stigmatize leaving early. Being casual about being on time renders the entire activity casual. Ditto for clothing. Same for the eucharistic fast. 4. Give constant, clear, and firm instruction about who should and who should not receive Holy Communion. Nothing desacralizes the sacred liturgy more than sacrilegious Communions, and the people need to be told this regularly. If you are not in full communion with the Church, if you are married outside of the Church, if you are in serious sin (including missing Mass on a Sunday or a Holy Day) and have not yet been to Confession: Do not eat and drink your own condemnation. Reasserting that the Most Holy Eucharist is the most sacred reality on earth and not to be profaned by unclean lips will go a long way towards sorting out the McChurch atmosphere that poisons our souls. 1. Say Mass as though the people were not present. This means that the priest is thinking about, speaking to, and turned towards God Most High. Paradoxically, it is this benign neglect of the people that gets the person of the priest out of the way and invites the people into the most intimate participation in the sacred mysteries. This is now counter-intuitive to most priests, who were taught that their first, last and constant job is make the people “feel welcome”, but it is absolutely and unconditionally true: say Mass as though the people are not there, and they will start to say things like, “That’s the first time in 40 years I feel like I’ve been to Mass.” Guaranteed. 2. Naturally, when speaking to the people, the priest must look at them. But except when speaking directly to the people, the priest’s entire attention (shown by posture, direction of eyes, etc.) must be directed away from the people and towards the Throne of Grace. For example, the Collect is not addressed to the congregation. Why face the people when you are speaking to the great I AM? And in the Eucharistic Prayer, the words “Take this all of you..” are not directed to the congregation, so when you say those words, Father, do not look at the people. The entire Anaphora is directed to God the Father, so do not look at your congregation when you are speaking to the Ancient of Days. 3. Eliminate the words of introduction in the entrance rite. Simply cut them out completely. This little interlude is one of the worst mistakes in the 1970 Missal; it’s like pulling the emergency brake on a train moving at 80 mph: the whole thing comes crashing to a disturbing halt. Give one homily, and give it when you should … in the homily. No off the cuff remarks, no improvisation after Holy Communion. 4. To the maximum extent possible, hide your personality under the chasuble. Who the celebrant is ought to be as nearly insignificant as possible. The priest’s job is to pull back the veil between God and man and hide himself in the folds, and this task is made nearly impossible by the ever expanding personality of “The Presider” who feels compelled to intrude his personality into every part of the sacred liturgy. The people aren’t there to see us, Father, and if they like our jokes, then we can let loose at cocktail parties. But not in the liturgy. 5. Sing the liturgy. Most parishes sing around the liturgy, but the liturgy itself is meant to be sung. Unless a priest is truly tone deaf (and even then he can learn to sing recto tono), he should sing, at least at Solemn Masses, nearly every word out of his mouth. From “In the Name of” to “The Mass is ended” and including most especially the Eucharistic Prayer (in whole or at least the words of the institution narrative), the priest should sing the liturgy. In the Christian East, it was once clear that a man who could not sing had no priestly vocation. I wouldn’t go that far, but singing the priestly prayers is an essential part of the sacred liturgy, and when it is done well, the re-enchantment of the liturgy is literally at hand. 6. Remember that every liturgy leaves chronological time and enters kairotic time. In chronos we say Good Morning; in liturgical kairos we say Dominus vobiscum. If we do not depart from the texts of the Church, then we stand a fair chance of taking the people with us into the never ending liturgy of the New Jerusalem. This is also why slow walking, talking and gestures are important. Same with hiding street clothes under sacred vesture. Ditto for the athletic shoes of the altar boys. 7. Yes, that’s altar boys, not androgynous altar servers. Want to encourage young men in the parish to think about the priesthood and all the men to take seriously their responsibilities for masculine headship in their families and the Church? Then restrict the service of the altar to boys and young men. 1. Take Cardinal Mahony’s pastoral letter on the celebration of parochial liturgy and throw it on the fire. Watch it burn. Now go take a hot shower. 2. Reject the ideology that got us here. Root and branch, cut it out of yourself. Empty seminaries, despoiled religious orders, plummeting Mass attendance, and wholesale immorality among clergy and laity alike are probably pretty good clues that the vocation to holiness which is our baptismal second birthright is getting obscured along the way. 3. Read good books that will help you understand the real nature and purpose of the sacred liturgy. Two excellent places to start are The Spirit of the Liturgy by Joseph Ratzinger (who now goes by a new nom de plume) and Looking at the Liturgy by Aidan Nichols, O.P. For the mechanics of celebration, start with Peter Elliott’s Ceremonies of the Modern Roman Rite and Ceremonies of the Liturgical Year. 4. Now approach the altar in spirit and truth, and worship the LORD in the beauty of holiness.